Police were a visible presence Saturday at two town halls in Fairfax County on Saturday, including one that had been cancelled but nevertheless attracted hundreds of demonstrators. 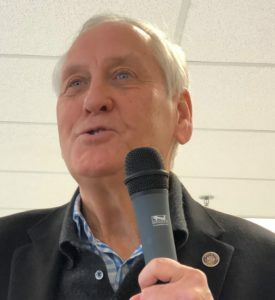 The unusual police presence highlighted the emotional nature of two issues state legislators are dealing with currently – a racist photo connected to Gov. Ralph Northam, and partisan vilification of Del. Kathy Tran (D-42) over comments she made regarding an abortion bill. In the meeting that went off as scheduled, state Sen. Dave Marsden (D- 37) and Del. 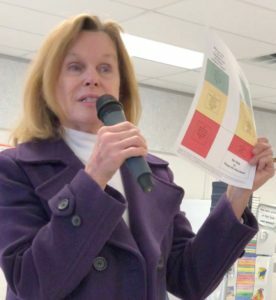 Kaye Kory (D-38) met with about 50 members of the public at Sleepy Hollow Elementary School in Falls Church to hear opinions and discuss issues. Sen. Marsden began the town hall by reading a statement signed by members of the state Senate Democratic Caucus calling for Northam’s resignation, after it was revealed that a racist photo – showing a man in blackface and another person in a Ku Klux Klan robe and peaked hat — had been included on Northam’s page in his 1984 medical school yearbook. Northam first acknowledged that he was in the photo then retracted that statement and said he had no knowledge of it. Marsden became noticeably emotional as he apologized to Virginia’s African-American community for this reminder of the terrible times of racism. These times are not over yet, he said, as shown especially by the current polarizing actions of the Trump Administration in Washington. Abortion also was raised in the meeting. Del. 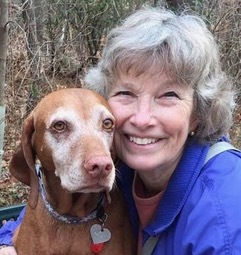 Kory defended Tran’s abortion bill, which would simply have reduced required doctor approvals from three to one in some abortion cases, but was denounced by pro-life supporters and some Republicans as supporting infanticide. Del Tran herself has received death threats after making, then clarifying, a misstatement about the bill’s effect on late-term abortions. The bill was defeated in a House committee last week. Marsden and Kory also fielded questions on other topics including the state budget, gerrymandering, the Equal Rights Amendment and medical marijuana. 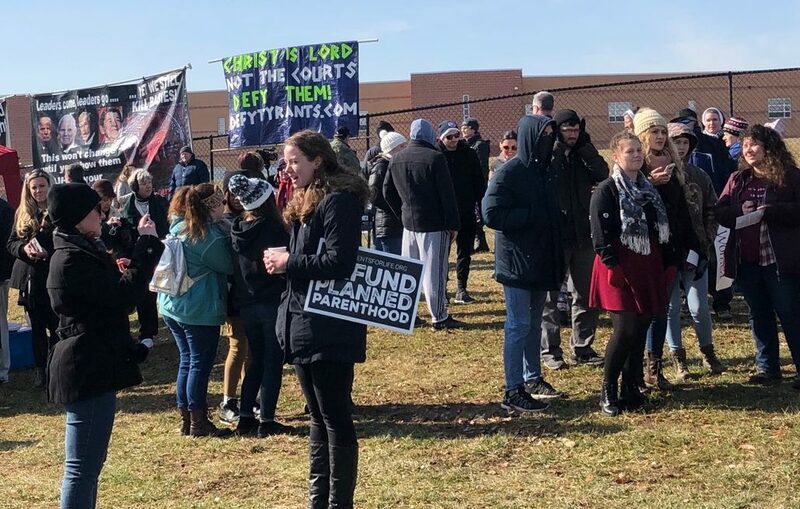 At about the same time, hundreds were demonstrating against abortion at South County High School in Lorton, site of a scheduled town hall meeting with Tran that she had cancelled for security reasons. Their signs called for supporters to vote, pray and protest, and claimed divine sanction for their position.